The total volume handled by the Port of Dunkirk in 2014 was 47.10mt (million tonnes). This was an excellent result for France’s third-largest port, an increase of 8% compared with the previous year. At 23.6mt, generated essentially by the steel industry (ArcelorMittal), dry bulk was up by 9%. It was a particularly good year for ore (13.5mt, a rise of 13%). Coal made some recovery but was still down 7% (5.1mt). On the other hand, grain reached a new annual record with 2.3mt, 48% higher than in 2013. The tonnage has not been close to this total since 1991 (2.2mt). ‘Small’ solid bulks were stable at 2.6mt. This type of activity offers real added value compared with the other ports of the North Sea range due to Dunkirk’s privileged geographic location, its capacity to berth large-size bulk carriers and its expertise in the handling of heavy bulk. 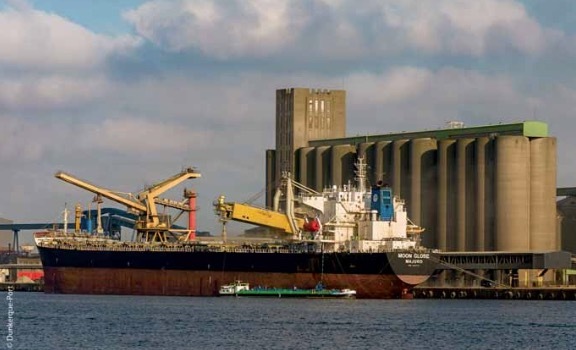 Dunkirk’s Western Bulk Terminal (QPO) has a draught of 18.50m and the idea would be to make this terminal into an ore hub not only for ARCELOR but for other clients too. Dunkirk is one of the only ports that has large land reserves: 3,000 hectares out of the total occupied area of 7,000. This means it can easily satisfy businesses seeking a strategically- positioned site, very close to the sea and with road and rail links. What is more, the Port of Dunkirk, as France’s foremost rail freight hub, is covered by a 250km network of railway lines. This proactive policy is fully in line with the national ports strategy for the development of logistics and consolidated overland transport for large volumes. With all this, any company that decides to set up here is assured of excellent maritime links and an easily accessible hinterland. With its covered storage areas, some of them wharfside, DMT offers a complete solution of discharging and reloading ships and barges or trains for all types of small bulk cargoes. In particular, the terminal is specialized in the handling of powdered goods and has specific equipment for this. The quay and storage yard extension was commissioned at the beginning of 2013. The maritime quay and the waterway berth provide access for ships and barges and allow high throughputs at loading and discharge. A further 15,000m2 of wharfside storage yards means DMT can offer new, competitive logistics solutions. With private railway sidings, weighbridges and a train intake pit, DMT offers a reception and shipment rate of 300 tonnes per hour for agricultural products.The facilities also include truck loading and unloading stations and road weighbridges. Another of DMT’s strengths is its 65,000m2 of total available storage capacity, 55,000m2 of which is designed for the storage of fertilizer and other ores (magnolite, clinker, gypsum, etc). DMT can offer customized solutions such as bagging services. Specializing in almost all types of dry bulk, SEABULK is particularly active in the sector of fertilizer, agricultural bulks, bauxite, lime, scrap metal, etc, and also offers its clients large areas of open storage and possibilities of covered storage. SEABULK is also a major operator of the port of Dunkirk in the field of industrial heavy bulks. Having its facilities in the western part of the port (with direct access to the sea), the terminal boasts 200,000m2 of storage space and can accommodate ships with draughts of up to 18.50m. Its 650 metres of quayside allow two Capesize ships to berth simultaneously. Supported by the ambitious investment policy of Nord Ce´re´ales, the port of Dunkirk has beaten record after record in grain exports. This development coincides with the return of the rail mode on this market. Nord Ce´re´ales declares that it has shipped more than a million tonnes in just three months, setting a new quarterly record. Per grain type, 980,000 tonnes of wheat was exported to the Middle East, North Africa and Asia, and 110,000 tonnes of barley to Asia. The growth of grain export volumes is also boosted by a reorganization of land-based logistics. Alongside waterway transport, which accounts for 52% of supply, the rail mode is again being used after a gap of ten years, enlarging Dunkirk’s hinterland towards eastern France.